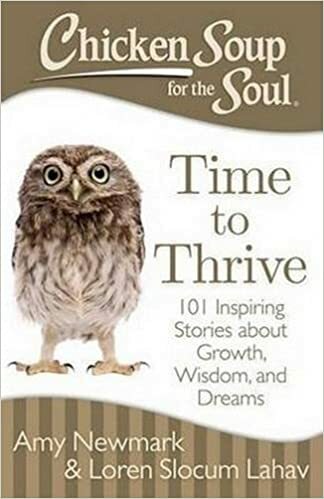 To say that I am honored and humbled to be a part of “Chicken Soup for the Soul: Time to Thrive: 101 Inspiring Stories about Growth, Wisdom, and Dreams” is a huge understatement. To be associated with one of the world’s most successful book series is almost too much to imagine. But that isn’t the only reason that I am thrilled to be involved with Time to Thrive. A big part of it is because of the theme of the book – thriving. Just the word alone gives me chills. We have all been there; in circumstances that seemed way to too big to handle. Situations that consumed us and made us feel we were no longer in control of our own life and our own destiny. We have allowed people to make us feel as if we could no longer thrive. But, we do have control. We have always had control. It was only a matter of choosing to thrive or not to thrive. And, it is also a matter of what we do with our lives once we choose to live it to the fullest. Sharing your story, sharing your hardships, and celebrating your victories with those around you will empower them to also realize it’s their time to thrive. You never know when someone who is full of confidence on the outside and failing to thrive on the inside. Since working on this book and with the new release, I am amazed at story after story that I have heard about people who once felt things were hopeless only to turn them around and fully flourish and prosper in life. I’m so thankful that they were brave enough and strong enough to tell those stories. I’m not just referring to the stories that made it into the book. I’m talking about the stories that you and I hear every day. Small triumphs against gigantic odds. That is what it’s all about. It’s about hitting a wall of adversity and continuing to move forward. It’s about not retreating when the going gets way too tough. It’s about not being ashamed of your story and shouting from the mountain tops as a means to help others who have yet to find their own voice. I encourage you today to THRIVE! To progress toward or realize a goal despite or because of circumstance. Celebrate it, baby because it is your time!